Venice's smaller (but very busy) train station is an important transfer point, and it also serves locals and tourists who commute into the historic center from the mainland. 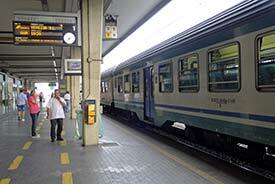 ABOVE: A train waits to depart for Venice from Platform 1 in Mestre's stazione. Local commuters, such as workers and university students who live on the mainland but go to Venice each day. Passengers on long-distance trains between other Italian or foreign cities, which often stop at Venezia Mestre on the mainland instead of making a diversion to Venezia Santa Lucia. Mestre isn't a huge station, but it does have quite a few platforms, and it has all of the services that you'd expect at a station in a small city. It's also a busy place: According to the Venezia Mestre page at Grandistazione.it, VE Mestre handles about 85,000 transit visits and 500 trains per day. A Google aerial photo map shows the station, downtown Mestre (above the railroad tracks), and the adjacent dormitory and industrial suburb of Marghera (below the tracks). The green "B" on the map points to the station entrance. You can zoom out and use the map's directional controls to see the rail and road causeway between Mestre and Venice. For more pictures of the station, with captions that describe what you'll find at Venezia Mestre, go to page 2 of this article.